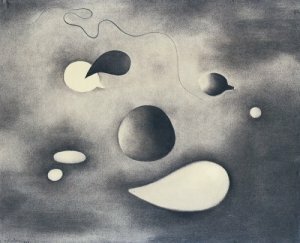 Paule Vézelay: Flying Forms, 1948. The exhibition private view (Wednesday 13 April, 6–8.30 pm) features a drawing performance event by Harald Smykla to mark the publication by England & Co of a monograph documenting his work. The exhibition includes works by: Maliheh Afnan, John Banting , Jack Bilbo, Barbara & Zafer Baran, Rolf Brandt, Michael Buhler, Patrick Caulfield, Henry Cliffe, Elisabeth Collins, Michael Druks, John Dugger, Rebecca Forster, John Furnival, Madge Gill, William Green, Heinz Henghes, Albert Herbert, Roger Hilton, Linda Karshan, Jo Kent, Christine Khondji, RB Kitaj, James Lancaster, Jeanne Masoero, Conroy Maddox, André Masson, John Melville, Alastair Morton, Sean (Farouq) Molloy, Richard Nie,Valerie Potter, Ralph Rumney, Geneviève Seillé, Colin Self, Harald Smykla, N.H. Stubbing, Ionel Talpazan, William Turnbull, Paule Vézelay, Jason Wallis-Johnson, Scottie Wilson.